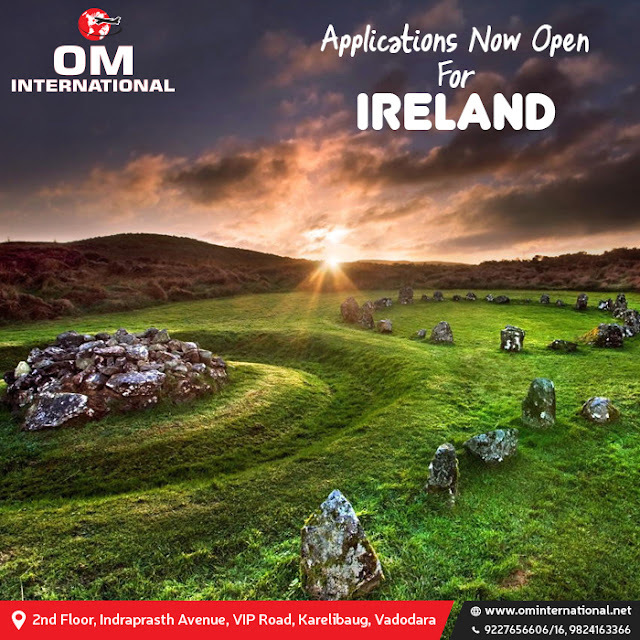 OM VISA Consultancy - Global Immigration, Students, Visitor, Business & Work VISA Consultants: STUDY IN IRELAND WITH TOP END UNIVERSITIES AND GET UP TO 50% SCHOLARSHIP!!! through OM INTERNATIONAL...!!! STUDY IN IRELAND WITH TOP END UNIVERSITIES AND GET UP TO 50% SCHOLARSHIP!!! through OM INTERNATIONAL...!!! STUDY IN IRELAND WITH TOP END UNIVERSITIES AND GET UP TO 50% SCHOLARSHIP!!! OM INTERNATIONAL is the career center for students who want to study abroad. We help students realize their dreams of going to foreign countries, including USA, Canada, European Union, UK, Ireland, New Zealand, Australia, and Singapore. We’ve got tie-ups with hundreds of top universities around the world and we can guide you as to what country and which university suits your profile. We want to create the perfect connection between the student and the University. At OM VISA SERVICES, we are a leader in the fields of Student Visa, Coaching & Immigration. Our values are to provide the best service, at affordable prices, with efficiency and genuine professionalism. Everything that we do revolves around our values. From our services to the results we deliver, it is about adding value to our students realize their dreams. We want to be the most recognized and trusted in the fields of student visa consultancy, immigration services & Coaching. Inculcating the right cost-effective services to achieve your goals, a commitment to you, our customer, we provide principled and ethical solutions for you. Aligning our values to your goals, we offer premier, highest-quality services to you. Facilitating the interaction between the student and the University, we gather all of the information you require before you apply. Ever-increasing our reach, we build tie-ups with new universities, which results in new opportunities for our students. Broadening the scope of high academic standards, our organization actively researches golden chances for you. Initiating the services, we thoroughly measure your profile with our universities requirements. Leading expertise comes together to form your preparation. Scanning through hundreds of universities, we finalize for you. · It takes 8-9 hours to reach to Ireland. · Hub for IT & Pharma students. · University College Cork/Trinity College Dublin/University College Dublin and many more are Top 20 Universities in the world. · International students studying at Irish institutions have options to work part-time for 20 hours /week. · Whereas the UK does not have a stay back period after Masters/Bachelors but Ireland has a 2-year stay-back option. · IELTS-6.5 Bands overall with no band less than 6.0 bands in each module for UG & PG. Although Irish Gaelic is recognized as the official language of Ireland, only 36% of the Irish population speak it and the country is predominantly English spoken. You may have heard the Irish accent on TV or film, and it may overwhelm you at first. But you will soon become accustomed to it, and living and studying in Ireland is a great way to improve your listening and speaking ability. One of the major benefits of studying in Ireland is the post-study visa. This makes it easier for students to look for job opportunities in the country after they graduate and, once they have found employment, they are then eligible to apply for a green card/work permit. In addition, the Irish government has also agreed to extend the ‘stay back option’ to two years from one year for non-EU/EEA students who study at level 9 or above in the national framework. Ireland is home to some of the best universities in the world. Trinity College Dublin is ranked 117th in 2018 THE World University Rankings and has an international reputation of the highest quality, while University College Dublin and National University of Ireland, Galway rank in the top 250. There are plenty of generous scholarship opportunities available in Ireland. For example, Trinity College Dublin offers bursaries worth €5,000, NCI Galway €2,000 and UCD provide 50% and 100% discounts on your tuition fees. Ireland is like few places on earth. Beautiful landscapes, scenic beauty, famous hospitality, and a rich culture of music, drinking, and sport. Did you know that there is one pub per 100 people in Dublin? Your main goal is to study hard, but letting your hair down is encouraged! Want to make some extra money, or earn valuable work experience in an English speaking environment while studying in Ireland? Students can work up to 20 hours during semester months and 40 hours during the holidays. For students looking to find employment or work experience with huge international businesses, Ireland offers almost unrivaled options relative to its size. The likes of Microsoft, Google, Apple and Dell all have offices here and often look to the universities for potential new employees. 5. WORK EXPERIENCE CERTIFICATES / APPOINTMENT LETTER / PAY SLIPS ETC.